Although agonistic autoantibodies against type-1 angiotensin-II receptor (AT1-AA) are frequently detected in women with preeclampsia, the clinical significance of AT1-AA in association with epithelial ovarian cancer (EOC) has not been identified. In an attempt to clarify this issue, we measured serum AT1-AA titer from EOC patients (n = 89) and healthy normal subjects (n = 55), correlated AT1-AA titer with EOC stage and grade, and demonstrated the effects of purified AT1-AA on migration of ovarian cancer cells and angiogenesis of chick embryo chorioallantoic membrane. We found that the AT1-AA titer was significantly higher in EOC patients compared with healthy control subjects (1.77 ± 0.28 vs. 0.35 ± 0.05, P < 0.01). The positive rate was averaged by 72.1±2.5% in EOC patients and 15.5 ±1.5% in control (P < 0.01). Increased AT1-AA titer in EOC patients was associated with advanced stages and grades of EOC, and positively correlated with level of vascular endothelial growth factor (r = 0.855, P < 0.01). Furthermore, AT1-AA directly stimulated migration of ovarian cancer cells and enhanced microvascular density of chick embryo chorioallantoic membrane. These AT1-AA-mediated effects were significantly blocked either by an autoantibody-neutralizing peptide or an angiotensin II type I receptor antagonist, losartan. Taken together, we found that a higher serum AT1-AA titer may be associated with advanced progression of EOC in patients and play an important role in development of EOC by promoting cancer cell migration and angiogenesis. These findings implicate that AT1-AA might be selected as a detectable biomarker and potential therapeutic target in diagnosis and treatment of EOC patients. Epithelial ovarian cancer (EOC) is the sixth most common cancer and the seventh cause of death worldwide among women who develop gynecological cancer , with the estimated 22,280 new cases and 15,500 deaths in the United States in 2012. The vast majority of EOC patients are usually diagnosed with advanced stages due to the lack of adequate early screening tests and early specific symptoms during development of EOC . The standard treatment for advanced EOC patients includes debulking surgery followed by platinum–taxane based chemotherapy. These patients, however, are also at great risk of recurrence and emerging drug resistance with a more than 70% of relapse rate and a mean 18 months of progression-free survival period [2, 3]. Therefore, understanding the pathogenesis of EOC and identifying early detectable biomarkers are essential to improve overall survival rate in advanced EOC patient. It has well been defined that angiotensin II (Ang II) derived from the activated renin-angiotensin system plays a key role in the regulation of cardiovascular homeostasis through its two receptors: Ang II type 1 (AT1) and type 2 (AT2) receptors, which maintain arterial blood pressure, fluid and electrolyte homeostasis. Through the AT2 receptor, Ang II evokes vasodilatation, sodium excretion and blood pressure reduction, and thereby counteracts the effects of AT1 receptor . However, increasing evidence suggests that Ang II is also involved in tumor cell migration/invasion, angiogenesis and metastasis through AT1 receptor during the tumor development [5–7]. In patient with EOC, it has previously been reported that Ang II enhances vascular endothelial growth factor (VEGF) secretion, angiogenesis and tumor cell invasion via up-regulating G-protein-coupled AT1 receptor; importantly, angiogenesis and peritoneal dissemination of the EOC can selectively be blocked using AT1 receptor antagonist [6, 8]. Therefore, considerable effort has been placed on the development of Ang II blockade therapy as a new strategy for EOC treatment. Recent studies have demonstrated that agonistic autoantibodies against type-1 angiotensin II receptor (AT1-AA) detected in preeclampsia induces significant placental trophoblast invasion , suggesting that AT1-AA is one of the potential causative factors in development of preeclampsia. We have previously reported that AT1-AA constricts human fetoplacental blood vessels and restricts fetal perfusion through activating Ang II AT1 receptor . Although animals studies have shown that activation of AT1-AA is associated with elevation of intracellular Ca2+ in vascular smooth muscle cells , stimulation of placental and vascular NADPH oxidase  and activation of NF-κB , all of which may cause inflammation and contribute to pathogenesis of preeclampsia via AT1-AA, there is less specific data to show whether AT1-AA is elevated in patient with EOC and correlated with the advanced progression of EOC. Therefore, in the current study, we examined the serum AT1-AA titer in EOC patients and determined whether change in AT1-AA level is associated with malignant grades and angiogenic factor, VEGF. Using AT1-AA purified from EOC patients, we demonstrated the effects of AT1-AA on migration of ovarian cancer cells and microvascular density of chick embryo chorioallantoic membrane. Furthermore, we investigated whether the AT1-AA-elicited biological effects could be suppressed by autoantibody-neutralizing AT1-AA peptide, and whether cell migration and angiogenesis stimulated by AT1-AA could be blocked by Ang II AT1 receptor antagonist. The study included 89 malignant EOC patients who were diagnosed and operated in the third hospital of Capital Medical University during the period of 05/2010 to 04/2012. Cases were chosen based on the histological grades and clinical stages of EOC patients according to the International Federation of Gynecology and Obstetrics (FIGO) criteria. The healthy control subjects (n = 55) were enrolled from laparoscopy-negative cases on the clinical assessment at the same hospital. No significant difference in age was found between these two groups. The consent form was signed by all patients and the research protocol was approved by the Institutional Committee for the Protection of Human Subjects of Capital Medical University. Cases were excluded if patients were associated with 1) autoimmune diseases and endocrinal diseases; 2) complications derived from other different organ systems; 3) immune deficiencies diseases; 4) significant gastrointestinal diseases. All clinical and laboratory data were recorded. Serum samples were collected from the patients in both groups and stored at −80°C until use. The serum AT1-AA level in patients was detected by ELISA as we reported previously . Briefly, 96-well microtiter plates were coated with 1 μg/ml AT1R-ECII peptide synthesized from patients (GL Biochem Ltd, Shanghai, China) and incubated overnight at 4°C. After washing the plates with PBS three times, 50 μl serum samples were added to the plates and incubated at 37°C for 1 h. The biotinylated goat anti-human IgG antibody (1:3,000, Zhongshan Inc., Beijing, China) or streptavidin-peroxidase conjugate (1:2,000 Vector, CA, USA) was then incubated separately at 37°C for 1 h during washings. Finally, 2, 2-azino-di (3-ethylbenzothiazoline) sulphonic acid (ABTS)-H2O2 (Roche, Basel, Switzerland) substrate buffer was applied for a half hour before reading. The optical densities (OD) from these plates were measured at 405 nm in a plate reader (Molecular Devices Corp, CA, USA). The AT1-AA titer was expressed as the ratio of positive/negative (P/N), i.e., (the OD of specimen - the OD of blank control) / (the OD of negative control - the OD of blank control). The positivity of the serum sample to AT1-AA was defined as P/N ≥ 2.1, while the negativity was defined as P/N ≤ 1.5. All assays were performed in duplicate. Commercially accessible ELISA kit (DaKeWe Biotechnological Corp, Shengzheng, China) were used to determine the patients’ serum VEGF level according to the manufacturer’s instructions. VEGF concentration was expressed as ng/L and the assays were performed in duplicate. AT1-AA peptide fragments equivalent to the sequence of human anti-AT1 receptor antibody (AT1R-ECII, 165–191, I-H-R-N-V-F-F-I-I-N-T-N-I-T-V-C-A-F-H-Y-E-S-Q-N-S-T-L) was synthesized by solid-phase peptide synthesis method (GL Biochem Ltd, Shanghai, China). The purity of synthetic peptide was confirmed with a high pressure liquid chromatography as we reported previously . The total immunoglobulin G was isolated from serum samples with AT1-AA positive EOC patients or AT1-AA negative healthy normal subjects by Mab Trap Kit (Amersham, NJ, USA). The purities of extractions were assessed by sodium dodecylsulfonate–polyacrylate gel electrophoresis (SDS–PAGE) as we reported previously . Human ovarian cancer cells (OVCAR3) were purchased from the Cancer Hospital of Chinese Academy of Medical Sciences, Beijing, China and maintained in DMEM supplemented with 10% FBS, 2 mM l-glutamine, 100 units/ml penicillin and 100 μg/ml streptomycin. For all experiments, cells were detached with 0.25% trypsin and 0.02% EDTA and washed once in complete medium before use. Migration assay was conducted according to the manufacture’s recommended protocol (BD Biosciences, New Jersey, USA). Briefly, OVCAR3 at 5 × 104 concentration were suspended in 300 μl of serum free media in the upper chamber with pre-coated filters (6.5 mm in diameter and 8 μm pore-size) with or without AT1-AA, Ang II, AT1R-ECII or Ang II AT1 receptor antagonist, losartan. Bottom chambers were filled with medium containing 10% FBS as a chemoattractant. After cells were allowed to seed on the chambers for 24 h at 37°C, cells on the upper chamber and migrated cells at the bottom chamber were wiped with a cotton swab and then mixed with staining solution containing 0.125% coomassie blue in a mixture of methanol, acetic acid and water in a ratio of 45:10:45. The results were visualized under an inverted microscope from 5 randomized high power fields (x400). Results were calculated from the average of 3 separate assays conducted in triplicate. Fertilized white leghorn chicken eggs were received at day 0 and incubated for 3 days at 37°C with constant humidity. On day 3, eggs were rinsed with 70% ethanol and a square window (0.5 cm2) was made with a pair of sterile scissor and cut away a circle of shell, thus exposing the underlying membrane (the chorioallantois). After the eggs (n = 8/each group) were treated with saline, AT1-AA, Ang II, AT1R-ECII or losartan, respectively for 30 min, the window was sealed with transparent tape and the eggs returned to the incubator at 90% relative humidity without turning. After 72 h of incubation, the CAM was fixed using 3.7% formaldehyde for 15 min, cut 3 cm2 from the center and mounted on the slides for observation. The angiogenic results were visualized on an inverted microscope from 5 randomized fields. For each experiment, the staggered images were digitized and results were calculated as a mean of microvascular density per high power field (x 400). All data were calculated as mean ± SE. Statistical analysis was performed with SPSS 15.0 software. The positive rates in the two groups were compared with chi-square test. The t-test was applied for comparing two independent sample means, and the one-way ANOVA was used for comparing means of more than two samples. P < 0.05 was considered to be statistically significant. Patient characteristics, stage and grade are shown in Table 1. The mean age of the EOC at primary diagnosis was 50.4±11 years and the mean history of the EOC was 7.4 ± 6 years. The mean age of the EOC at menarche was 15±2, and at menopause was 47±4. The FIGO stage of EOC patients was classified as follows: I: 6%; II: 56%; III: 23%; IV: 4%. Most EOC patients were at the grade III (61%). Fifty-four patients (28%) had ascites whereas 31% patients had no such complication. Values are mean ± SE; others represent the percentage of total patients. The serum AT1-AA titer in EOC patients and healthy control subjects was measured by ELISA. As shown in Figure 1A, the serum AT1-AA titer was significantly increased from 0.35 ± 0.05 in healthy normal subjects to 1.77 ± 0.28 in EOC patients (P < 0.01). The average positive rate of AT1-AA in EOC patients was significantly higher than that in healthy normal subjects (72.1%±2.5% vs. 15.5%±1.9%, P < 0.01). The correlation of serum AT1-AA with clinicopathological outcomes was analyzed in EOC patients. As shown in Figure 1B, the number of AT1-AA positive patients was increased with clinical FIGO stage: 45% in stage 1, 61.5% in stage II and 72.8% in advanced stage III. Moreover, the AT1-AA titer was also significantly higher in patients with an advanced grade (Figure 1C): 61.7% in grade 1, 72.7% in grade II and 80.1% in grade 3. These results indicated that AT1-AA level increases with progression of EOC stage and grade. Level of AT 1 -AA in EOC patients. Relative to the healthy normal subjects, AT1-AA titer was significantly increased in EOC patients (A). The number of AT1-AA positive patients was associated with clinical FIGO stage (B) and grade (C). Values are mean ± SE. *p < 0.05 vs. the normal subjects (Nor); † P < 0.05 vs. the stage I and grade I, respectively. To determine whether serum AT1-AA titer is associated with angiogenesis of the tumor, we examined the serum level of VEGF by ELISA in the same series of EOC patients. As shown in Figure 2A and 2B, VEGF level was significantly increased in patients with advanced FIGO stage and grade (i.e., at level III) compared with those in an early FIGO stage and grade (i.e., at level I). Positive linear correlation among the serum AT1-AA level and VEGF was detected, (Figure 2C, r2 = 0.855, p < 0.01), suggesting that AT1-AA may play a role in angiogenesis during development of EOC through enhancing VEGF expression. VEGF level in EOC patients and healthy normal subjects. Increased level of VEGF was detected in advanced stage (A) and grade (B). Scatter plots showed a positive linear correlation between VEGF level and AT1-AA titer in EOC patients (C). Values are mean ± SE. *p < 0.05 vs. the normal subjects (Nor); † P < 0.05 vs. the stage I and grade I, respectively. OVCAR3 cells derived from the progressive adenocarcinoma of the ovary were used in this study. Migration of OVCAR3 cells stimulated by adding AT1-AA was enhanced in a dose-dependent manner. As shown in the top panel of Figure 3, cell migration rates were consequently increased relative to the control when cells were treated with different dose of AT1-AA (50, 100, 200 nM) for 24 h. To demonstrate the potency of AT1-AA in stimulation of cell migration by activating angiotensin AT1 receptor, OVCAR3 cells were treated either with exogenous AT1-AA (100 nM) or Ang II (100 nM), respectively before subjecting to cell migration. As shown at the bottom panel of Figure 3, both AT1-AA and Ang II produced a comparable level in cell migration. Stimulation by AT1-AA (100 nM) on cell migration was completely blocked either by the AT1R-ECII (100 nM) or by the selective Ang II AT1 receptor antagonist, losartan (300 nM), suggesting that AT1-AA has direct stimulating effect on tumor cell migration and enhancement of OVCAR3 cell migration by AT1-AA is mediated by Ang II AT1 receptor. Addition of losartan or AT1R-EC II alone had no effect on migration of OVCAR3 cells. Effect of AT 1 -AA on migration of OVCAR3 cells. AT1-AA increased migration in a dose-dependent manner (top panel). Relative to the control (A), cell migration by AT1-AA was significantly enhanced (B), which is comparable to the level found in Ang II (C). Enhancement of migration by AT1-AA was blocked either by AT1-AA-ECII (D) or losartan (E). Values are mean ± SE. n = 3 for each group. *p < 0.05 vs. saline control (Nor); †P < 0.05 vs. AT1-AA and Ang II. HPF = high power field (x 400). AT1-AA administration caused a significant increase in microvascular density in the CAM. Figure 4 shows the representative photographs of AT1-AA-treated and saline control CAM. Quantitatively, in each of the six experiments, the microvascular density of the CAM treated with AT1-AA (100 nM) was increased by 60-70% compared with saline control. Addition of Ang II (100 nM) also increased the microvascular density of the CAM to a comparable level as that found in the AT1-AA treated CAM. Enhancement in the microvascular density by AT1-AA was significantly blocked either by AT1R-ECII (100 nM) or losartan (300 nM), suggesting a role of AT1-AA in angiogenesis through stimulating Ang II AT1 receptor. Simultaneous addition of only the AT1R-ECII (100 nM) or the losartan (300 nM), without AT1-AA or Ang II, did not affect the microvascular density when compared with saline control (Figure 4). Effect of AT 1 -AA on angiogenesis of the CAM. Relative to the saline control (A), AT1-AA significantly increased microvascular density of the CAM (B) to a comparable level as did by Ang II (C). Enhancement of microvascular density by AT1-AA was blocked either by AT1-AA-ECII (D) or Ang II AT1 receptor antagonist, losartan (E). Values are mean ± SE. n = 6 for each group. *p < 0.05 vs. saline control (Nor); †P < 0.05 vs. AT1-AA and Ang II. HPF = high power field (x400). These results are the first to demonstrate that AT1-AA level is significantly elevated in EOC patients. Enhanced AT1-AA titer was associated with advanced stage and grade of the EOC and positively correlated with VEGF level in patients. Using cultured OVCAR3 cells and the CAM of chick embryo, we found that AT1-AA has direct effect on cell migration and angiogenesis through activating Ang II AT1 receptor. AT1-AA, an autoantibody against angiotensin II type 1 receptor, which is characterized to activate the receptor via specifically interacting with the second extracellular loop of the Ang II AT1 receptor, has been documented to play a role in the pathogenesis of preeclampsia and hypertension [10, 11, 13–15]. However, AT1-AA level and function has not been examined or identified in the ovarian cancer. In the current study, we found that serum titer and positive rate of AT1-AA were significantly increased in EOC patients. More importantly, this study revealed that the level of AT1-AA is significantly elevated with an advanced FGIO stage and grade in EOC patients, supporting the concept that AT1-AA may participate in ovarian cancer development and progression. As it has well been demonstrated, the FIGO stage and grade are poor prognostic factors for overall survival in EOC patients . Therefore, monitoring serum AT1-AA level might be of great value as a single marker in detecting all stages of EOC patients for clinical screening test, diagnosis and prognosis after therapeutic intervention. VEGF is a main angiogenic factor in development of ovarian cancer through promoting angiogenesis and significantly associated with tumor progression and poor prognosis [16–18]. Recent studies have shown that targeting inhibition of tumor angiogenesis through VEGF and its various signaling pathways is an effective therapy to suppress tumor growth and progression [8, 17]. Our results showed that higher AT1-AA titer is positively correlated with VEGF level in advanced stages of EOC patients, consistent with previous findings showing a role of Ang II in cancer development through VEGF gene expression and secretion [8, 17]. Stimulation of AT1 receptor by Ang II has been reported to be involved in tumor progression in a number of cancers including EOC [12, 13]. The postulated role of AT1-AA in cell migration and tumor spread led us to test if AT1-AA has direct stimulating effect on ovarian cell migration. We selected either autoantibody-neutralizing AT1-AA peptide, AT1R-ECII as an inhibitor or selective AT1 receptor antagonist, losartan to test the direct effect of AT1-AA on cell migration and illustrate if this process is mediated by AT1 receptor . We found that the migratory number of OVCAR3 cells was significantly increased in AT1-AA treated group, which was blocked either by AT1R-ECII or losartan. 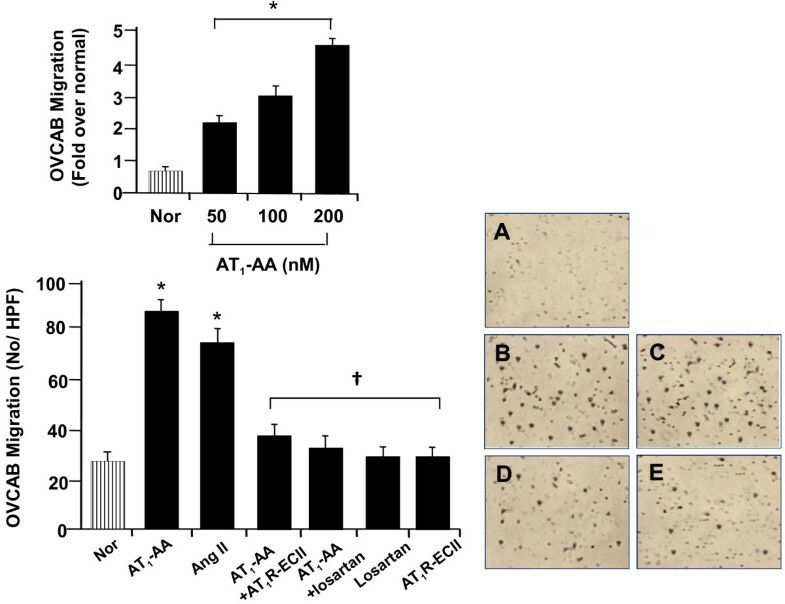 These data suggested that AT1-AA has direct effect on migration of ovarian cancer cells through activating AT1 receptor, consistent with a previous report showing that Ang II-induced tumor cell invasion, angiogenesis and peritoneal dissemination are blocked by Ang II AT1-receptor antagonist . However, mechanistic studies are needed to further elucidate how AT1-AA activates the Ang II AT1 receptor. In line with our data, it has previously postulated that AT1-AA may alter the structural conformation of Ang II AT1 receptor so that the receptor’s ability binding to circulating Ang II is enhanced . The CAM of chick embryo has widely been selected to study the morphological aspects of tumor angiogenesis and metastasis . We chose the CAM of chick embryo as a test model to demonstrate angiogenic substances in our study because of its extensive vascularization and easy accessibility to investigate mechanisms of action of proangiogenic and antiangiogenic molecules . We found that addition of AT1-AA at the same dose that causes OVCAR3 cell migration is effective in stimulating angiogenesis in the CAM, which was parallel with data showing elevation of VEGF in EOC patients. This increased microvascular density elicited by AT1-AA was comparable to the level as that in the Ang II group. Furthermore, we showed that the use of AT1R-ECII or AT1 receptor blocker, losartan completely inhibits AT1-AA-induced angiogenesis of the CAM. These findings suggest that an enhancement of angiogenesis by AT1-AA involves activation of Ang II AT1 receptor, thus selective Ang II AT1 blockade therapy could efficiently inhibit the AT1-AA-elicited angiogenesis under conditions exposed to AT1-AA as it has previously been reported . There are several limitations to this study that need to be mentioned. First, although in vitro studies speculated the mechanisms responsible for the migration of cancer cells and angiogenesis through AT1 receptor, this study did not measure AT1 receptor expression to show whether such a change is associated with AT1-AA-mediated effects. Second, although a raised titer of AT1-AA was detected in EOC patients, the “cause-effect” relationship remains to be investigated. In this regard, it will be interesting to determine whether the AT1-AA titer falls in patients undergoing treatment. Third, the size of the study population was relatively small and limited only in the Asian patients. Therefore, future large-scale clinical trials will be necessary to further determine whether AT1-AA titer is also altered in EOC patients of different ethnicities. In summary, we found that serum AT1-AA is elevated in higher proportion of EOC patients, which is associated with advanced stages and pathological grades of EOC, and appears to promote the ovarian call migration and angiogenesis through Ang II AT1 receptor. This study provides promising data showing that AT1-AA may play a significant role in development and progression of EOC, and might be considered as a potential therapeutic target in treatment of EOC patients. This study was supported by grants from the Science and Technology Plan Project of the Beijing Municipal Education Commission (KZ201110025023) and the National Natural Science Foundation of China (81070263). The authors declare that there is no conflict of interest that would prejudice the impartiality of this research work. LS and HRL participated in research design, patient’s investigation and manuscript writing. JY and SLZ carried out the in vitro experiments and data acquisition; HYX and TL performed data analysis and interpretation. All authors read and approved the final manuscript.